Phil Plait, aka the "Bad Astronomer," chatted with Newsy about the upcoming total solar eclipse and why he thinks there's so much hype. 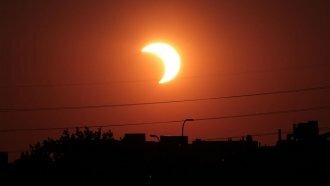 Hotels are booked, solar eclipse glasses are selling out and the U.S. Department of Transportation has warned drivers of additional traffic on Aug. 21. To say there's a lot of excitement over the total solar eclipse is an understatement. The Transportation Department says about 200 million people live within a day's drive to a prime total solar eclipse viewing spot. But why is this such a big deal, and why are people going out of their way to see it? Those are just some of the questions we asked Phil Plait, aka the "Bad Astronomer."